Performing Arts at Joeys is vibrant and innovative, adding great richness and energy to the College community. 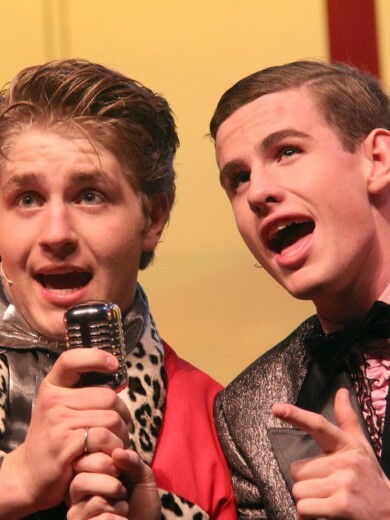 The Music and Drama Departments share a passionate commitment to not only engaging the boys in a range of experiences and developing their talents, but also instilling in them a life-long appreciation for the arts and providing them with a balanced, well rounded education. St Joseph’s comprehensive Music program is vibrant, engaging and designed to help boys develop their talents to their full potential. With more than 40 practice studios, an Apple Mac computer lab, a mobile recording facility and expert teachers and tutors, the program provides an opportunity for students of all abilities to cultivate and fine tune their skills and develop a lifelong appreciation for music. SJC’s 25 music ensembles play an important role at many College events, performing for students, staff, families, special guests and the wider community. Drama at the College has a reputation for excellence in both performance and production. The College hosts regular showcase evenings, participates in theatresports competitions and stages a number of productions each year. The talents of both music and drama students and staff are showcased in the College’s spectacular musical stage shows. Just some of the productions that have received rave reviews are Hairspray – the Broadway Musical in 2015, SHOUT! The Legend of the Wild One in 2012 and Joseph and the Amazing Technicolor Dreamcoat in 2011. In recent years, students involved in performing arts at the College have had the opportunity to take part in international tours, performing in front of appreciative audiences in New Zealand and the USA and gaining invaluable experience. Boys enjoy a well-rounded, balanced education.